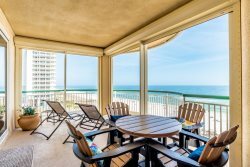 Beautiful Views from your 300 sq ft Circular Balcony! Exclusive Beach Colony is located on 11 acres of fabulous beachfront. The ingenious angular living room design transforms every residence into a Corner unit. Wall-to-wall sliding doors and adjoining windows actually wrap around the living room, filling it with light, and revealing the panoramic beauty of the Gulf. The sweeping 300 SF terrace will be a favorite spot for quiet moments and lively gatherings alike. Blackout drapes throughout the entire unit. The uniquely situated Master Bath is a world unto itself. The whirlpool bath is surrounded by large, wrap-around windows, which can open to offer both a view and a feel of the hypnotic Gulf. 1750 SF with upgraded tile throughout Living, Dining, Kitchen and Carpet in Bedrooms. Reserved covered parking space available only with this unit. Electronics include 40" TV, DVD in Living Room, 32" TV, DVD in Master Bedroom, 20" TV in Guest Bedroom 1 and 22" TV in Guest Bedroom 2. It was a pleasure dealing with Perdido Key Realty and greatly appreciated always getting "live" person to speak with every time we called! Everyone we spoke with was very helpful, always friendly, professional and knowledgeable!! Beach Colony West was a great experience on all levels. So much so that all 6 of us are returning next year to Perdido and to the same unit at Beach Colony! Have worked with Perdido reality for about 8 years. Staff is always friendly and accommodating. Enjoyed this property at Beach Colony.